Lexington Corporate Properties Trust, a New York real estate investment trust, has acquired the fee-simple interest in a 1.8-acre downtown property marketed as the "Honolulu Super Block." The purchase price was about $35 million, according to an announcement yesterday by Lexington. 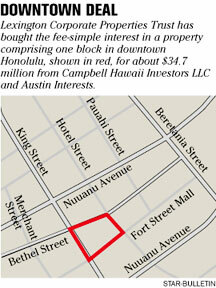 The trust bought the property from Campbell Hawaii Investors LLC and Austin Interests, and has no immediate plans to develop the property. The block, bound by South King, Bethel, Hotel and Fort streets, is home to three low-rise office and retail buildings, along with a two-story retail building occupied by Macy's and a five-story parking garage. Colliers Monroe Friedlander listed the property about a year ago, marketing it as one of the few remaining redevelopment sites in urban Honolulu. The block has buildings totaling close to 300,000 square feet of rentable space. Under current zoning, the property is expected to support mixed-use development up to a total of 595,000 square feet, with a 450-foot height limit. Allowed uses include a high-rise condominium, office, retail, multifamily and hotel. The super block also was being touted as a centrally located property near Honolulu's core business district and Chinatown's growing arts and culture district. The existing buildings are 97 percent occupied, with leases that expire by the end of 2012. Lexington, a real estate investment trust that owns and manages office, industrial and retail properties throughout the nation, was not unfamiliar with the downtown property. In 1996, Lexington acquired a leasehold position in the Macy's department store, then known as Liberty House, at the super block for about $10.6 million. "This acquisition demonstrates an important advantage of investing in properties subject to long-term net leases," said John B. Vander Zwaag, executive vice president of Lexington. "Through our leasehold investment in Macy's department store, we have been witness to the growth of the downtown Honolulu market and the corresponding increase in property values, and we were able to capitalize on this rare opportunity to purchase a prime block in downtown Honolulu." Other recent acquisitions by Lexington include the majority interest in Six Penn Center, a 19-story office building in Philadelphia. Andrew Friedlander and Jon-Eric Greene of Colliers Monroe Friedlander in Honolulu represented the sellers in the super block deal. Lexington has retained Colliers to lease and manage the property.